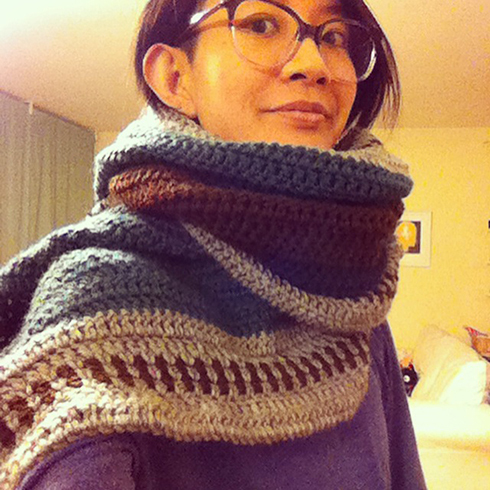 Stumbled across Two of Wands’ beautiful Saddlebrook cape scarf pattern on Instagram, thought it was just the thing I need for the chilly office! The arm openings are perfect for typing and tea drinking, and it’s so stylish‐looking! I love the cleverly designed edging detail. It’s a beautiful design, and it’s free! And! 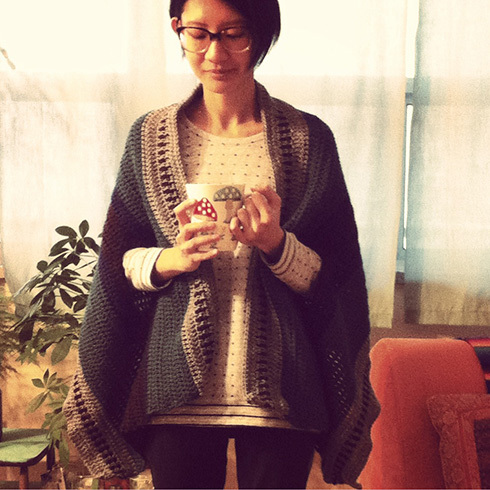 I had been looking for a project through which I can use up the almost‐full skeins of yarn leftover from the corner‐to‐corner crochet blanket for my parents last Christmas, it’s awesome! It’s very packable, so I imagine it would also be great to bring on the train or plane or road trips! And it makes a nice giant scarf! 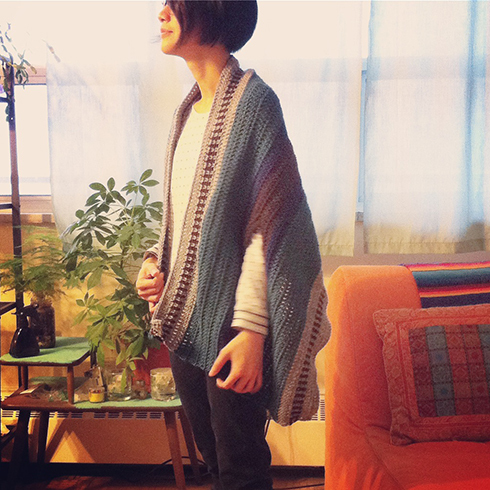 I had modified the pattern so that it’s shorter (because I’m a shorter person, and I find it easier to move around if the cape is kind of regular coat length), and so that I could use the worsted weight yarn I have. So I thought I’d share the modifications in case you’re in similar situation! My cape measures 60″ x 20″. I used a 6mm hook, and started by making a chain of 182, then dc in 4th ch from hook (turning ch counts as a dc throughout). I used dc stitches throughout, 180 dc across. 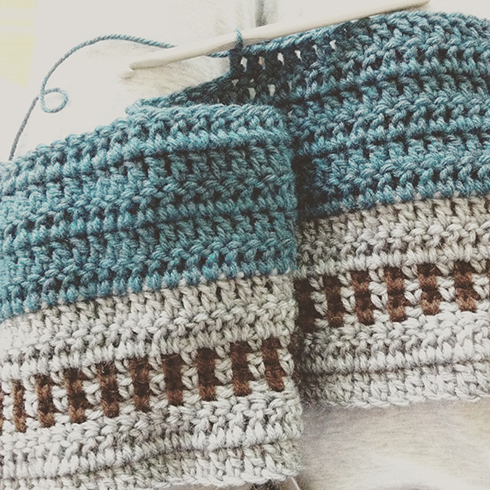 I followed the pattern for the edging (the grey/brown part), then split for arm openings on the 14th row after edging. Arm opening stitch count as follows: 25 dc, 20 fdc (for arm opening), 90 dc, 20 fdc, 25 dc. Then I finished the other half of the cape in the same way as the first half. I used Bernat Super Value yarn, less than half a skein of the grey, brown and blue, and almost a full skein of the teal. Now let’s throw on the cape and unleash superpowers. Bonjour Trish. Je trouve cette écharpe‐cape très élégante et, effectivement, on peut l’utiliser de beaucoup de façons ce qui la rend très pratique en plein de circonstances. Je crois bien que je vais me laisser tenter! J’ai essayé de trouver les explications gratuites mais il me semble qu’il faut quand même passer commande et je ne suis pas sûre que celà fonctionne pour la France, alors je vais improviser,je pense qu’il faut faire un grand rectangle avec les fentes pour les bras. En tout cas, félicitations pour ce bel ouvrage. Thanks Claudine! Yes you would still need to add the item to your “cart” on the website and enter some information, but the price will come out to $0, and you’ll be able to download the pattern after checkout :) happy crocheting! Youupee! çà y est, j’ai les explications! Il ne me reste plus qu’à fouiller dans mon stock pour trouver les bonnes pelotes de laine. Je vous souhaite une excellente fin de semaine. A bientôt sur votre blog que j’aime beaucoup.